Princess Chloe's cousin has been cursed by the gods. 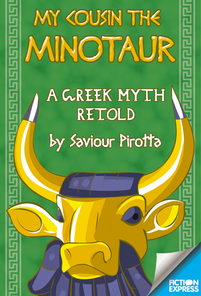 They have turned him into a dangerous monster - a minotaur. The locals have sent for Prince Theseus to deal with him. The only way Chloe can save him is to make a special potion. But the magic ingredients can only be found on Mount Olympus and to get them Princess Chloe has to get past guards, monsters and angry gods. Will the princess manage to reverse the curse before Prince Theseus arrives to kill the beast?